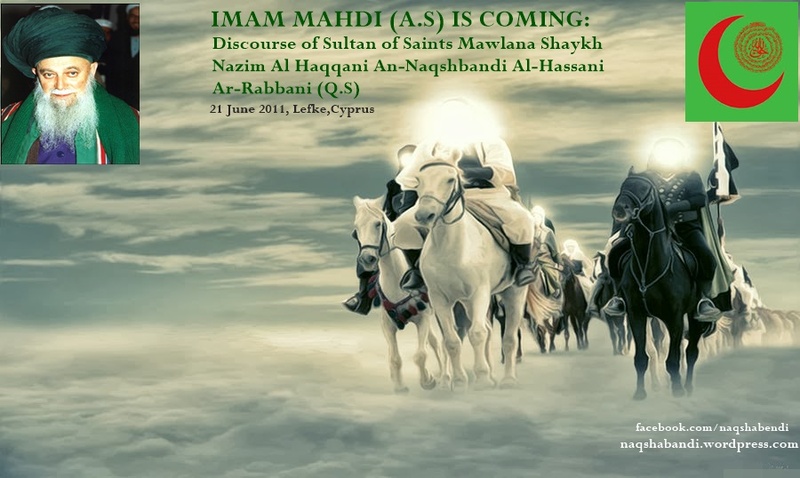 Imam Mahdi (A.S) is coming! This world is only considered a home for those who are homeless. Allah..Allah they collect from this world, only the mindless people run after to collect from it.May Allah never leave us to be tricked Allah. But Soldiers from Damascus will come, Mahdi (alaihissalam) is not appeared yet, but his hand is in it.80 flags will enter from here. Guest: Three months before his appearance? 3 Months before the appearance of Mahdi (A.S) this will happen? Mawlana Shaykh: The conquest of Constantinople (Istanbul), opening Constantinople (Istanbul) and the third world war (Armageddon) will take six months and on the seventh month the Dajjal/Antichrist will appear. Question: Is it soon Mawlana? Mawlana Shaykh says: O Allah Almighty please make us enter Your Mercy oceans with your good servants. Question Hajj Al Akbar in four Months, in 4-5 months, so this means now? Mawlana Shaykh: The movement is needed now,Armageddon, Conquest of Constantinople will happen after Armageddon. The opening of Constantinople, Istanbul will be conquered again, soldiers from here will move, soldiers from Sham (Syria) will move, they will all enter Istanbul. Astaghfirullah (I ask Allah’s forgiveness) As our Lord Wills and Is Pleased. All the Absolute Divine Order is to Allah Almighty. He (Almighty Exalted) Has the Absolute Order.He is the All Powerful and Almighty. He can never be defeated by anything. He is the Absolute Winner (Almighty Exalted). Support Islam O our Lord. Russians also,their back is itching (they are looking for trouble) armies will also enter Russia. they will enter there, enter from Istanbul. From Istanbul, 80 divisions will enter Sham from the valley of Amuq (Aleppo) and the same amount of soldiers will come up from here. A force come from Sham, says, Grand Shaykh (Sultan of Saints Shaykh Abdullah Faiz Dagestani-Qaddasallahu Sirrahu): ” A force from Sham (Syria) comes to Amuq and they battle.Armageddon take place there.And, a third of the forces can’t hold out, and they draw back. One third become martyrs , and the remaining one third become victorious, win the battle.And there, they are called Banu Asfar (Yellow people), Russians, they defeat Banu Asfar, and drive them out till Istanbul. In Istanbul, even if you look for a medicine from them, can’t be found. Guest: You said before,that they will pass from Russia from up to Germany. Mawlana Shaykh: This is different. This one is down here 80 divisions. It says, 80 flags in the coming news, 50 divisions ,flags, in Amuq, near Aleppo, Armageddon will take place there. Now it is all gathering around there. It is piled in there. Allahu Akbar! “The Armageddon and 2nd Conquest of Constantinople (Istanbul) , it is incredible. First Armageddon will take place, then Istanbul will be conquered. No Russians, nor anyone from Russian’s side will be left in Istanbul. It will clear all of them out. Ya Rabb (O our Lord), Anta Rabb (You are our Lord)..It is Your Religion, that You had Sent. Your Beloved’s Flag (the Flag of Prophet Muhammad alaihiswalathu wa salam) does not go down like this, his flags are up like this, we are not afraid. We are not afraid. Why should we fear from Russia?. If China stands up! all nations in China will stand up Japan will take a hit from that, as well as Our Hussien says: It is all messed up, let him remove his bottom from there, and he will see. But people will be taken away, a lot of people will perish. Armageddon, will kill a lot of people, millions will be taken away. They may go! Clean ones will remain and Mahdi (A.S) will appear. Insha Allah, this year, it has come closer.